After leaving the campsite near the Turnagain Arm, we headed down Portage Glacier Road to find a campsite for a few days while we explored that area. The road follows the Portage Creek all the way down to Portage Lake, and the entire area is very lush and beautiful. We highly recommend visiting the area if you are heading that way. 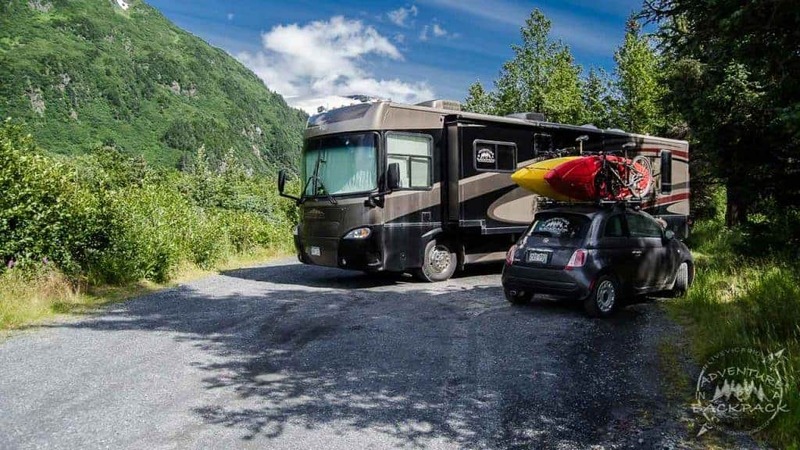 As we explored Portage Glacier Road, we found that there were actually quite a few boondocking campsites in the area. We were hoping for one on the water! While we did find a few that were on the river, they were either already occupied or inaccessible for our rig. We ended up in a quite gorgeous campsite that was on a creek (not Portage Creek), so we didn’t do too badly! This creek was just down a short path from our campsite. Note that none of these campsites had 4G signal with either AT&T or TMobile. We did have 1-2 bars of cellular signal randomly, but not enough to utilize our smartphones or even to check voicemail. It would likely only work to make an emergency call. That said, it was totally worth being away from our phones for a few days! Just across the street from the Williwaw Campground, there is a turnout that leads back to a small pond and walking trail. This is where we camped for 3 nights while exploring the area. The area is large enough for 6 or 7 campsites, and at one point during the weekend there were 4 RVs and 3 tent campers in this spot. We were the first ones to arrive, so we got first pick. We chose the campsite tucked all the way at the back of the parking area, which dead ended in our campsite. Since there were no trails that way or anything else back there, we were able to park at an angle to provide a bit of privacy for our campsite. Parking at an angle allowed us some privacy from other campers since we were on a dead end. 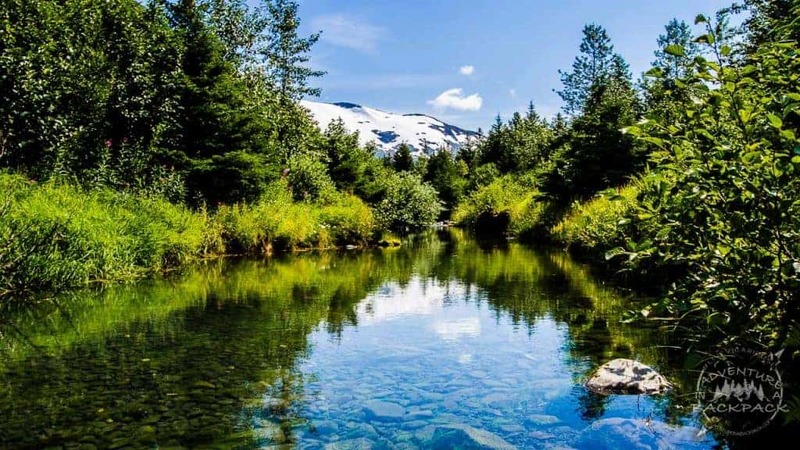 This camping area is 3 miles from the Begich Boggs Visitor Center on Portage Lake. There is a very nice walking trail that is just to the west of the campsite that leads to a salmon viewing area near the Williwaw Campground. If you take this trail and then continue through the Williwaw Campground to connect back up with the trail, you can walk a very scenic route all the way to the Visitor Center and the lake. The trail on the west end of the campsite takes you to Salmon Viewing and then continues all the way to the Begich Boggs Visitor Center. While this boondocking campsite was definitely large enough to accommodate our 38-foot rig, we did need to detach the toad in order to get turned around. The site could easily accommodate larger rigs, as it is flat and wide. There is a large dip at the entrance of the site from the road, but if you go slow and take it at an angle it’s not a problem. We didn’t have any issues with clearance in our rig or our tow car. The camping area is flat and relatively level, enough to where we didn’t need to put our jacks down. The site is relatively level and wide. 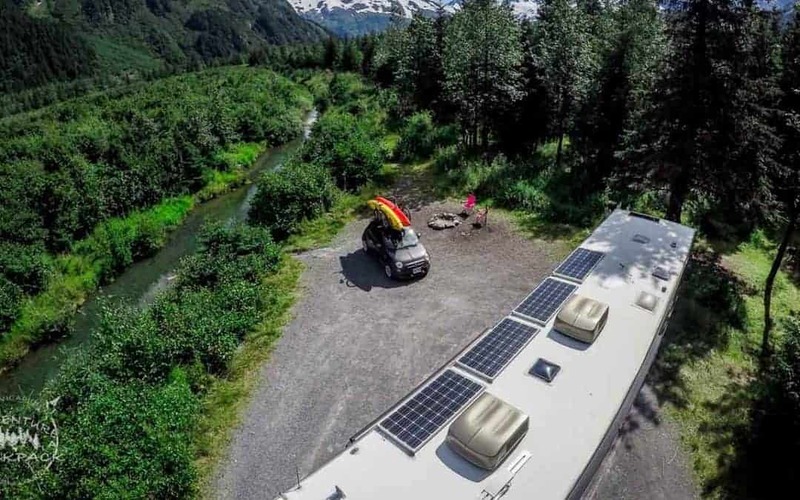 In addition to the campsite that we stayed at, there are many other options for boondocking in Portage Alaska. Although we are only listing two specific places here, there may be many more. We paddled the Portage Creek and saw a few other areas that seemed to be good potential, but since we did not check them out in the car, we cannot say for sure if they are feasible for RVs. The first alternative is another turnout that is just right on a pond. It is on the Tangled Pond and is 2.2 miles from the Begich Boggs Visitor Center. The area appears to be a premium location, as it was filled the entire time we were in Portage Alaska. It is a large, flat camping area with room for about 2 or 3 RVs, depending on the size of the rigs. 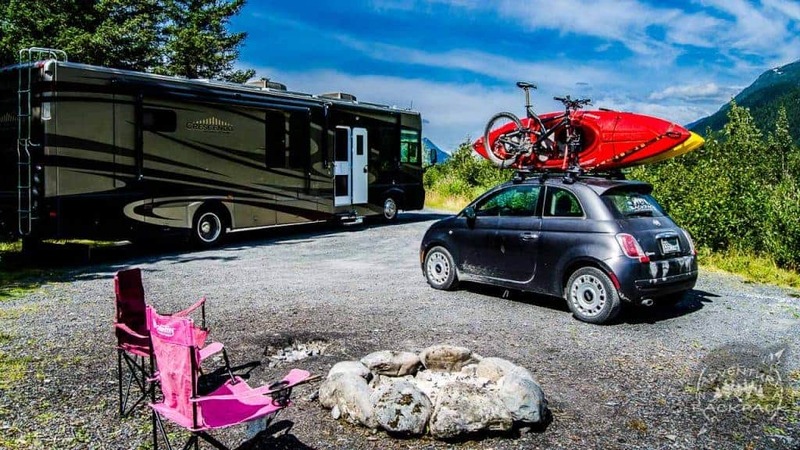 The space is not large enough to turn around with a motorhome, but if you unhooked the tow car, it would be fine to back out of. The good thing is that you can see the campsite from the road, so you can determine before you commit whether or not it is occupied. This seemed like a great alternative if it had not been occupied, as the entrance drive was much less rutted out and more accessible to low clearance vehicles. The bike/walking trail that connects to the Begich Boggs Visitor Center runs across the highway from this campsite as well, making for easy access to the Lake and Visitor Center. The second alternative campsite option for boondocking in Portage Alaska is a little further from the lake, but is still very nice. 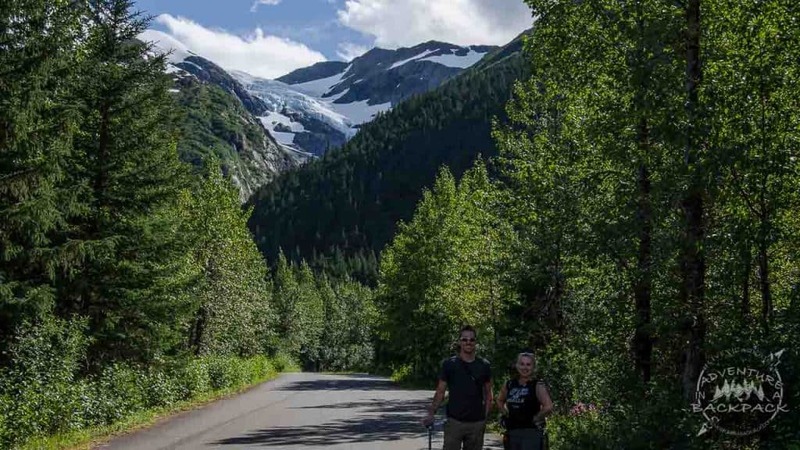 It is 4 miles from the Begich Boggs Visitor Center and does not connect to the bike/walking trail that we found. There is a hiking trail at the east end of the camping area, although we are not certain where it leads. This boondocking campsite is not quite as pretty as the other two options, but it is also on a pond. Who knew we would find three waterfront properties?! Ha! This campsite has about 5 or 6 camping areas, although only 2 are somewhat secluded from the others. The campsite on the far west side of the area would be great for large rigs, and our 38-footer would have fit no problem. It could easily accommodate larger rigs, just not as a pull-through. The whole area is gravel and fairly flat and level. Although this site isn’t as pretty as the others, mainly due to the large power lines running through it, it would work well for a base while you explore the area around Portage. After exploring the area around Portage Alaska, we would definitely recommend staying there a few days. We highly enjoyed the views, the waterfalls, the proximity to the lake and creek, and the overall experience. Head over to our Adventures for our full write-up of our paddle to the Portage Glacier! Subscribe to our newsletter for our most recent updates (don’t worry, we won’t spam you)! And check us out on SnapChat as Adventure_Pack! Until next time, #LiveVicariously!